Spanish Talmudist and cabalist; born in Spain about 1479; died at Safed, Palestine, 1589. He was thirteen years of age when his parents, banished from Spain, settled in Safed, where he studied under the direction of Joseph Saragossa. This statement, which is given by all his biographers, is contested by Frumkin ("Eben Shemuel," p. 48). Later David removed to Cairo, and in 1514 he is found there as a member of the bet din presided over by the "nagid" Isaac Sholal. In 1517, on the abolition of the office of nagid by the Turkish government, David was appointed chief rabbi of Egypt, which position he held for forty years. As he was highly revered alike for his vast knowledge, the integrity of his character, and the extent of his philanthropy, the yeshibah over which he presided attracted many distinguished pupils, among whom may be mentioned Bezalel Ashkenazi, and Isaac Luria, the father of the new cabalistic school. In the introduction to his commentary on the Song of Songs, Isaac Akrish paints in vivid colors the character of David, in whose house he lived for ten years. 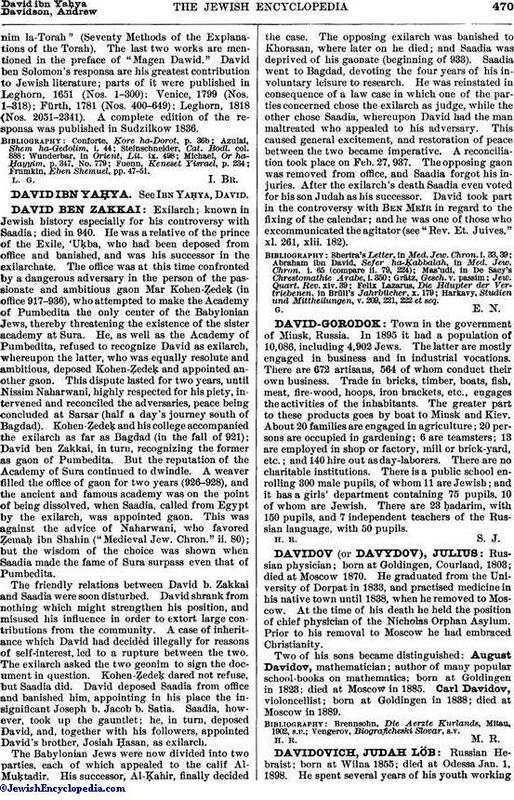 According to this writer, David was very prominent in both the social and the political life of Egypt, thanks to his high intelligence and to an ample fortune. During his rabbinate he introduced many reforms in the every-day life of the Egyptian Jews, as well as in their religion. It was he who abolished the use of the Seleucidan era among them. On attaining the age of ninety David resigned the chief rabbinate, and divided the greater part of his fortune among the poor, making special provision for scholars. He then removed to Jerusalem, but did not stay there long, on account of the burdensome taxes that the Turkish government had imposed upon him. He settled in Safed, where he became an active member of the bet din presided over by Joseph Caro, who held him in great esteem. David died, as shown above, at the age of one hundred and ten years. 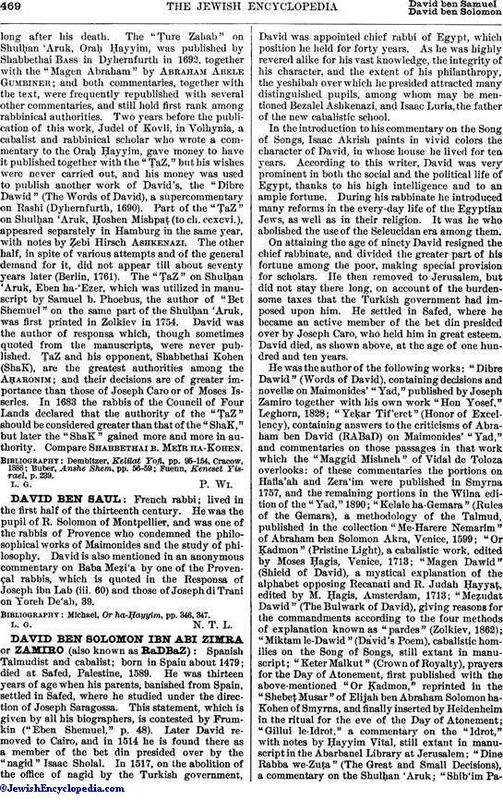 He was the author of the following works: "Dibre Dawid" (Words of David), containing decisions and novellæ on Maimonides' "Yad," published by Joseph Zamiro together with his own work "Hon Yosef," Leghorn, 1828; "Yeḳar Tif'eret" (Honor of Excellency), containing answers to the criticisms of Abraham ben David (RABaD) on Maimonides' "Yad," and commentaries on those passages in that work which the "Maggid Mishneh" of Vidal de Toloza overlooks: of these commentaries the portions on Hafla'ah and Zera'im were published in Smyrna 1757, and the remaining portions in the Wilna edition of the "Yad," 1890; "Kelale ha-Gemara" (Rules of the Gemara), a methodology of the Talmud, published in the collection "Me-Harere Nemarim" of Abraham ben Solomon Akra, Venice, 1599; "Or Ḳadmon" (Pristine Light), a cabalistic work, edited by Moses Ḥagis, Venice, 1713; "Magen Dawid" (Shield of David), a mystical explanation of the alphabet opposing Recanati and R. Judah Ḥayyaṭ, edited by M. Ḥagis, Amsterdam, 1713; "Meẓudat Dawid" (The Bulwark of David), giving reasons for the commandments according to the four methods of explanation known as "pardes" (Zolkiev, 1862); "Miktam le-Dawid" (David's Poem), cabalistic homilies on the Song of Songs, still extant in manuscript; "Keter Malkut" (Crown of Royalty), prayers for the Day of Atonement, first published with the above-mentioned "Or Ḳadmon," reprinted in the "Shebeṭ Musar" of Elijah ben Abraham Solomon ha-Kohen of Smyrna, and finally inserted by Heidenheim in the ritual for the eve of the Day of Atonement; "Gillui le-Idrot," a commentary on the "Idrot," with notes by Ḥayyim Vital, still extant in manuscript in the Abarbanel Library at Jerusalem; "Dine Rabba we-Zuṭa" (The Great and Small Decisions), a commentary on the Shulḥan 'Aruk; "Shib'im Panimla-Torah" (Seventy Methods of the Explanations of the Torah). The last two works are mentioned in the preface of "Magen Dawid." David ben Solomon's responsa are his greatest contribution to Jewish literature; parts of it were published in Leghorn, 1651 (Nos. 1-300); Venice, 1799 (Nos. 1-318); Fürth, 1781 (Nos. 400-649); Leghorn, 1818 (Nos. 2051-2341). A complete edition of the responsa was published in Sudzilkow 1836. Frumkin, Eben Shemuel, pp. 47-51.